Teenage shopping habits are commonly stereotyped on television and in the media, but not as often examined intensely. Every teen is thought to love shopping for clothes and spending money at the mall as frequently as possible, but is this actually true? Do teens actually enjoy shopping more than other age groups, or is this just a misconception? There are numerous teenage shopping habits that, as a teen, learning more about can help you on your next trip to the mall! Do Teens Like To Shop? If you've ever seen a television show dedicated to teenagers, you've likely seen how many shows paint teens as obsessed with shopping. Especially when watching shows like The Hills or Beverly Hills 90210, it seems like just about every teen is obsessed with buying clothes. Is this myth or is there some truth to it? 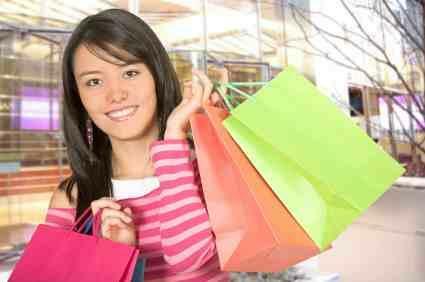 Teens like to shop--but so do others! : According to a market research study by Cotton Inc of women, 61% of those aged 16 to 24 that were polled enjoy shopping for pleasure when the clothes were for another, like a child or husband. However, that number becomes even larger for those aged 24 to 25--with 74% reporting enjoyment in shopping! Numbers stay high for other demographics including 35 to 55 (a number still higher than their teenage counterparts!) and 56 to 70. As women grow, their interest in shopping stays around much longer than their teen years! Teens have more disposable income than other demographics: According to the Washington Attorney General, teens have $104 of disposable income a week. As most teens don't have other expenses like a mortgage payment, student loan payments or other debts to pay, this income is thought of as disposable. In shopping terms, disposable income is another way of saying 'spendable' income. This alone may skew statistics on the topic as teens have more money to shop than other demographics. Teens and personal image: It can be argued that teens need to worry about their image more than other demographics. Popularity and peer pressure in high school can often be dependent on liking or having what is hip. Staying abreast of these type of trends often involves spending money on them. When a woman is in her 30's, the focus becomes more on practicality for the office than what others are wearing. If teens have more money to shop and generally enjoy shopping, what are some teenage shopping habits that can be observed? Are there any particular things that teens do that other demographics don't? The Washington Post covers the phenomenon of teen shopping and has reported a few observations. Each teen buys for their passion: Using different teens as case studies, seven chronicled teens highlight what they spend money on. One teen--a novice photog--states her camera is the most expensive thing she owns. Another uses clothing and her personal style as her outlet in the world. Yet another teen only goes to stores that match her personal style. Teens are more true to their interests when shopping than anything else. Teen girls are more recreational shoppers: While the study was geared towards both sexes, the respondents were mostly female. Teen boys seem less interested in shopping for fun, the study concluded. Price still matters: Even though teens might not have other large expenses, they're still concerned about the price of the items they buy. In addition to citing personal style in store selection, many teens highlight price as influencing what they buy. Teens aren't the only ones curious about their demographics spending habits: so are stores. Most know and cater to the information above. As a result, many try to make trendy clothing affordable. If you can't find the newest style at one store, don't worry: there is likely another store nearby that falls into your style and price range. These stores are also more likely to have sales for high school students than other distributors. Keep these things in mind the next time you go shopping so you can grab more for less!